Stories of the misuse of power and the manipulation and abuse of women sicken and anger me. I welcome the long overdue shift that is taking place in this regard. Women’s collective voices have become impossible to ignore and are ushering in change. The #metoo movement has swept in, and I pray its influence will remain strong. May the long term effects be change, not just media attention. When saying “me too” doesn’t lead to action, it isn’t enough. Nowhere is this more true than with spiritual growth. We love it when someone describes how we are feeling—when they “nail it.” That desire to be understood is deep and normal. But too many of us stop at the “me too” moment, and settle for panacea fixes. We might look in the mirror and tell ourselves, “I am enough.” We join a yoga class to calm our minds. We may get to the glorious place of living authentically with a few close friends, dropping the mask and allowing our mess to be seen. But these things will only take us so far. The very best that the secular world offers will always fall short of the deep healing and wholeness that God offers us. One of the reasons that American women today are the most medicated, depressed, and addicted generation to date is because we are only willing to go so far in the journey toward wholeness. We’re told in Proverbs 24:3 that “by wisdom a house is built.” You are the house where the Holy Spirit lives, and you will be built strong and secure through wisdom. When Paul prayed in Ephesians 1:17 that we’d be given a spirit of wisdom, he was referring to the wisdom of the deep things of God. If we’re going to grow up in our faith, no longer being spiritual “infants, tossed by waves and swept along by every wind of teaching arising from human trickery,” (Ephesians 4:14) then we need to acquire wisdom. This means putting in our time studying Scripture, and then applying what we’ve read. This requires changing ourselves, instead of waiting for our circumstances or the people around us to change. Unquestionably, it would be easier to live the way that God asks if people treated the sensitive parts of our hearts with kid gloves. Unfortunately, certain people and circumstances set us off. We’re triggered- something causes a flashback or brings a memory to mind that takes us back to the emotions of a traumatic event. Recognizing our triggers is valuable, but not if all they do is give us an excuse to respond however we’d like. Author Martha Beck describes triggers as “our culture’s get out of jail free card,” and makes the important point that “triggers explain—they don’t excuse.” If we don’t look at it from this perspective, we’re acting like victims of our emotions. This is the response of a spiritual infant, an immature believer. What if we changed the way we looked at triggers? What if we got smart about what was really going on? The truth is, the enemy of our soul is behind much of the hurt we experience. He has made a study of our weak and tender places, and loves to exploit our wounds. He fights dirty. And this is exactly when we most want to run. This is when we want to numb ourselves to any negative emotion or experience. 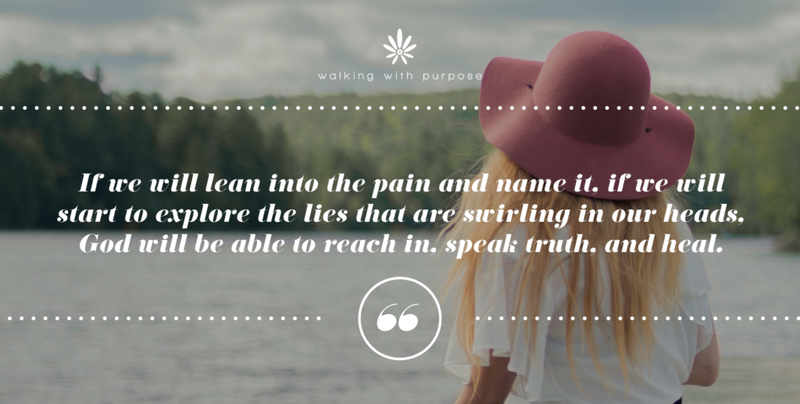 But if we will resist the urge, if we will lean into the pain and name it, if we will start to explore the lies that are swirling in our heads, God will be able to reach in, speak truth, and heal. God is always at work. He is continuously offering us opportunities for new spiritual growth. Those opportunities often come in unwelcome packages, but if we open them up and invite God in, we’ll be amazed at how we can grow. Speaking of growth, here at WWP, we are committed to keeping things new and fresh. As we continue to celebrate our 10 year anniversary, we are launching a new website (www.walkingwithpurpose.com) and updated look. We hope you love the changes as much as we do! God is doing something new in me, in you, and in WWP. Let’s invite the Holy Spirit to usher in a new season of growth and maturity for us all!